When making a credit decision lenders verify the loan applicant's Social Security Number (SSN) as a fraud prevention measure. The Social Security Administration (SSA), with the consent of the SSN holder, will verify if the SSN holder’s name, date of birth, and SSN match SSA’s records. The SSA returns a match verification of “yes” or “no.” If the SSA records show that the SSN holder is deceased, the SSA will return an indication that the SSN holder is dead. 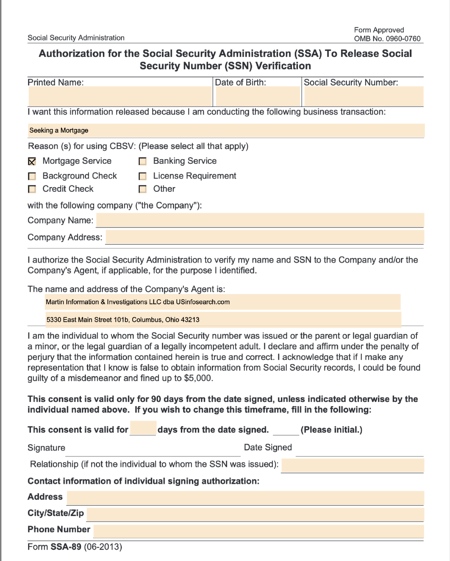 It is important to note that the SSA does not verify an individual’s identity, only that the SSN provided matches the name and date of birth (DOB) of the records on their file. Lenders are not required to perform verification of SSN, however it is a good first pass fraud prevention step, providing lenders with information confirming an applicant's name and SSN match SSA records which helps validate identity and reduces fraud risk. A business services account can be set up with the SSA's Consent Based Social Security Number Verification (CBSV) Service by clicking this link: https://www.ssa.gov/bso/bsowelcome.htm. This account allows completed and signed SSA-89 forms to be submitted to the SSA for processing. Fees include a one-time $5,000 initial enrollment fee, and a fee per-SSN verification transaction. Please note that the transaction fee charged by CBSV can change at any time. Verification Services providers who offer SSA-89 processing typically have invested in technology and workflow. Orders are submitted and processed online and in real time through system integrations with the SSA. Workflow wrappers ensure that the forms are completed for completeness and accuracy before the order is submitted to the SSA for fulfillment. A complete and accurate form must have borrower's complete name, date of birth, SSN, address, and personal phone. The form must also be signed and dated. The signature date is checked before form is submitted to the SSA as the form is good for only 90 days after it has been signed. Forms with any audit issues are reverted to the lender for correction. SSA-89 providers have established relationships with the SSA. Orders submitted are normally returned same day. They monitor processing status, errors (including Name and Social Security Number mismatches), and error notices for wage files and/or wage reports they have submitted. By monitoring the process they have been able to implement process improvements that save time and money. In addition, a lender can avoid the $5000 set up fee paid to the CBSV as a service provider has already incurred that expense. Are you able to accept electronic signature on the form SSA-89? What other data, whether proprietary or not, could be added to the product and what benefit does this extra data provide? Identity fraud is one of the leading causes of loan loss. SSN verifications are a common and effective way to fight identify related fraud and are generally inexpensive to procure.